One of the central rationales for making certain drugs illegal is to elevate their price and thereby reduce consumption. It’s astoundingly effective: illegality makes lightly processed plant matter (e.g., cocaine) more valuable by weight than gold. …inefficiency stems from having to operate covertly. The precautions required to evade detection make the production of drugs very labor intensive. Grocery-store cashiers, for instance, are more than 100 times as productive as retail drug sellers in terms of items sold per labor hour. Similarly, hired hands working for crack dealers can fill about 100 vials per hour, whereas even older-model sugar-packing machines can fill between 500 and 1,000 sugar packets per minute. This labor intensity of drug production, combined with the high wages demanded for that labor, are what drive up the costs of drugs; by comparison, materials and supplies — glassine bags, gram balances, and even guns — are relatively cheap. Caulkins and Lee provide a useful comparison point to appreciate the impact of illegality on price: If cigarettes suffered the same legal disadvantage as cocaine and heroin, they would cost about $2,000 a pack. This is a stark illustration of how taxes on a legal drug could never even remotely raise prices as high as does illegality. Even cigarettes taxes that attempt to raise the price per pack of cigarettes to one half of one percent of what their price would be under illegality are widely evaded and create huge black markets. The Rockefeller Institute has reported some largely encouraging data on states’ fiscal health. 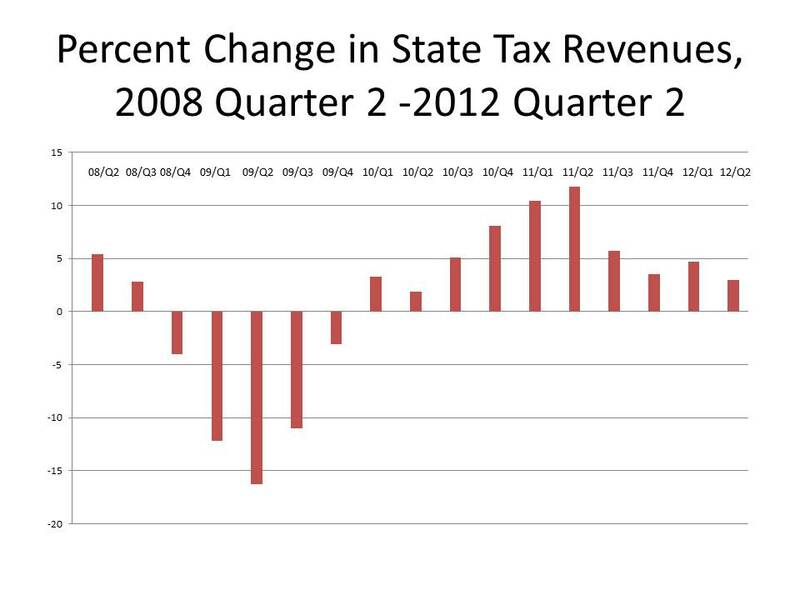 Average tax receipts have risen for the tenth straight quarter following the bloodshed of The Great Recession. The picture would have been much brighter if not for the outsized influence of California, which saw 2012 quarter 2 estimated tax receipts fall by 4.9% year on year. This election is a straight-up choice between a candidate who wants to raise taxes on the rich and a candidate who wants to keep cutting them. Isn’t it obvious that opponents of plutocracy ought to care deeply which candidate wins? Prospects for programs boosting public investment are virtually nil. Republicans stand a good chance of taking control of both branches of Congress after the next election. Their presumptive presidential nominee, Mitt Romney, may capture the White House. If so, his tax and regulatory proposals will most likely embody all that Stiglitz finds repugnant. Even if Romney loses, the American political system does not appear ready to respond to Stiglitzâ€™s call to arms. Yes, it’s true: due in part to the new system of campaign finance put in place by the Republican Supreme Court, even Democrats find their ability to legislate against plutocracy limited by their need to raise campaign funds from plutocrats. Simply re-electing Obama and keeping the Senate in Democratic hands won’t change that. But if Republicans manage to take both the Presidency and the Senate on a frankly plutocratic platform – which would enable them to lock in their partisan control of the judiciary for another couple of decades – that will tend to exacerbate the trend toward more inequality, while a Democratic victory would exert pressure in the opposite direction. This is more or less the same argument I had with Glenn Loury in a bloggingheads diavlog that unfortunately got eaten by technical problems and will have to be redone. The plutocrats don’t have any doubt about what’s on the table this fall: that’s why they’re going to spend a billion dollars or so to elect their homeboy. Nobody on the right is urging people to sit this one out because it doesn’t really matter. Only our side is burdened by this sort of thumb-sucking electoral nihilism, earlier instantiations of which elected Richard Nixon in 1968 and George W. Bush in 1980 2000. Update And of course there’s the $200 billion in downward income redistribution embodied in Obamacare, which will survive or not largely based on the results of this election. Do you know what Mitt Romney’s tax plan is? No? Well, neither does he. Well, don’t feel bad. Neither does he. So no fair criticizing the Romney plan. It doesn’t even exist. FootnoteÂ In any case, not knowing beats knowing what ain’t so. Author Mark KleimanPosted on March 7, 2012 March 7, 2012 Categories Everything ElseTags Medicare, Mitt Romney, Romney, scoring, taxes5 Comments on Do you know what Mitt Romney’s tax plan is?